It poured with rain for much of today. It had stopped by about 4pm, and as I walked home an hour or so later, a stunning post-rain burst of sunshine turned church towers to gold and tipped treetops with flame. 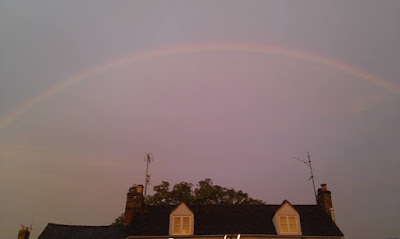 As I began to walk up the Woodstock Road the sun was setting gloriously on my left, while over on my right... a rainbow! Which way to look? - truly I was spoilt for choice! I took a few photos, regretting having left my camera at home (my phone is pretty old), then began to walk on, turning to glance at the rainbow to see if it had started to fade. I expected to have to look behind me but instead, the rainbow was constantly at my side, keeping pace with me as I headed home. I realised that usually, whenever I see a rainbow, I am either at home, looking out of a window - so the rainbow remains in the same place, as I do - or else I'm in a car or train, travelling at some speed and round bends, the rainbow appearing to weave around and switch sides. This time I simply walked up a road, past people staring at their phones, with the rainbow gliding beside and above me, holding me within its arc. I could have humorously said I was being stalked by the rainbow, but rather, I felt held. And even though the rainbow had faded before I arrived home, God's fidelity, I know well, endures forever.